Lock in a great price for Hotel Germano – rated 8.5 by recent guests! The staff was amazing! We arrived Saturday morning at 6.30 am. We could leave our bags at the front desk and they had 2 bathrooms we could use, clean and spacious. When we came back after breakfast at 10 am, they had put our luggage in our room and we could already use it. The staff was very helpfull with recommendations. The room was nice, very clean with airco, a good shower and towels we could use. We checked-out on sunday but they let us use the room until 23.30 without a fee! Amazing, so friendly! A big thanks! Muy buena atención. Limpio y cómodo. El AA congelaba y las camas eran cómodas. Excelente ubicacion frente mismo a la terminal de buses y a unas cuadras de la costanera y el centro. Hotel muy tranquilo y confortable. TODO BIEN Y LA ATENCION DEL PERSONAL ES EXCELENTE ALBERTO ES MUY AMABLE Y DEDICADO A QUE SUS PASAJEROS PASEN BIEN. Muy buena ubicación. Aun cuando no sirven el desayuno si tienen la amabilidad de recomendarte un muy buen lugar donde hacerlo. Pedimos agua caliente para el mate y nos proveyeron sin problemas. Ubicación. Reúne las condiciones costo y servicios. Es limpio. Atención muy adecuada. Sehr nettes Personal, von denen einer sogar gut deutsch sprechen kann. Sehr sauber und gepflegtes Hotel und perfekte Lage direkt gegenüber vom Busterminal. 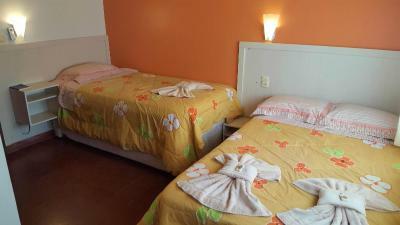 Located in Encarnación, Hotel Germano provides free WiFi. Guests can use a garden. All guest rooms in the hotel are equipped with a TV. The rooms come with a private bathroom. Posadas is 7 miles from Hotel Germano, while Bella Vista is 30 miles from the property. When would you like to stay at Hotel Germano? This double room has air conditioning. Guests can opt between a double bed or 2 single ones. House Rules Hotel Germano takes special requests – add in the next step!